Clap the mint leaves between your hands to release the mint’s natural oils. Add the mint leaves to the bottom of an old-fashioned glass or julep cup. Add the sugar. Using a muddler or the end of a wooden spoon, crush the sugar into the mint leaves. Add the berries. With the muddler, mash the berries into the sugar and mint and stir gently to combine. Fill the cup to the top with crushed ice. Top with bourbon. 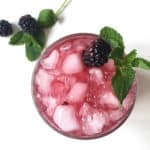 Garnish with a mint sprig and 1-2 blackberries.